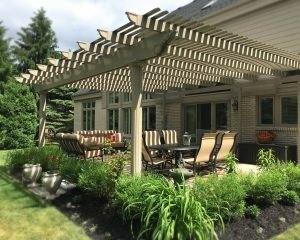 SRA Home Products — a second-generation family-owned and -operated company — is pleased to install top-of-the-line pergolas at homes throughout Villanova, Pennsylvania. 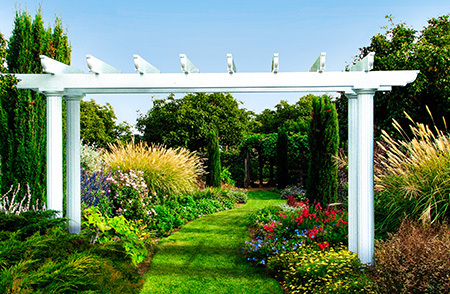 We exclusively carry pergolas manufactured by TEMO. With a heavy-duty, fully extruded aluminum frame and TEMO’s exclusive TEMKOR polymer coating, our pergolas are exceptionally strong and durable. Another feature setting our pergolas apart from the competition is their curved louvers — while many pergolas are built with flat louvers, our pergolas come with curved louvers that offer additional shade and protection from ultraviolet rays. We even offer operable pergolas, which are able to transition between open louvers and a closed roof at the push of a button. 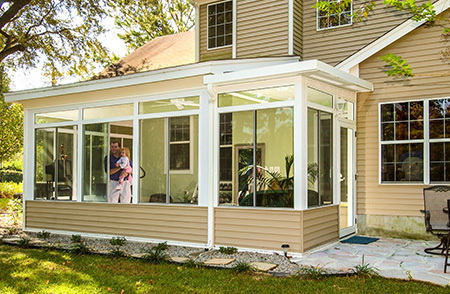 This option is a smart choice for homeowners who want to be able to relax outside even on rainy days. When you notice storm clouds starting to form, just press a button to activate a slow-motion motor with a 500-pound push/pull force, and watch your pergola louvers close to form a solid roof. Then, once the sun starts shining again, press the button again to switch back to an airy, open roof that gently filters in sunlight. To learn more about our customizable pergolas, call SRA Home Products today. We offer complimentary in-home consultations to homeowners in Villanova, PA, and surrounding areas, so just let us know a date and time that works for you, and we’ll arrange for one of our specialists to visit your home, take some measurements, and walk you through our various product choices.